While waiting for my Bus Pirate to arrive, and thinking about electronics in general, I was wondering if there was something more basic I/O than the Bus Pirate. 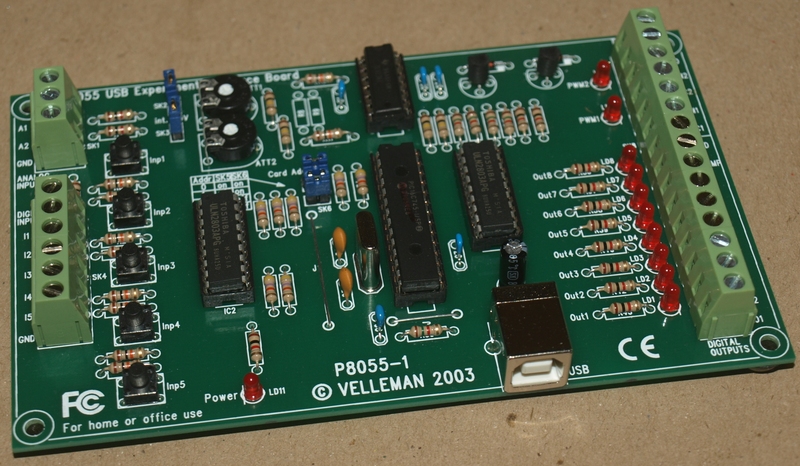 After trawling around the internet, I came across references to the Velleman K8055. I spoke to a good friend, Dave Mills, who has owns one and has set others up for jobs at his university; Dave recommended it and also informed me that it works well under Linux using libk8055 (C and Python) as well as lbk8055i.pm (Perl). For those interested, there is also a good (though basic) GUI available, called k8055gui. I bought the K8055 as a kit, from Maplin Electronics. This comes either as a kit of parts or as a pre-assembled device. The pre-assembled device costs in at an extra Â£10. Naturally, I opted for the cheaper option, as I have had a lot of experience designing, building and debugging circuit boards, and feel confident in soldering it. If this is not the case for you, then go for the pre-assembled one – that said, the board wasn’t too hard to construct; I’d say about 4/10. I followed the instructions included in the kit and all worked perfectly (as I had expected). I used the Linux command line program, k8055, which enabled me to test everything was working – it was – excellent! My Velleman K8055 – Finished! Meter Clock was the first project. It is two moving coil meters calibrated with time. The K8055’s DACs are used to drive the meters. SAA1064 IC was used to drive a large 4 digit 7-segment display. The code implements a poor man’s bus and makes a clock. Nokia 3310 LCD project uses the K8055 to implement an SPI bus to interface to the Nokia 3310 LCD.